Mirror is indeed a necessary thing for every woman. It follows us everywhere and always. We may easily forget the house keys, our cell phone and even our favorite lipstick, but it is simply impossible to forget the mirror. The wo man essentially needs to please herself and the others with her beauty, and what - if not the mirror - can tell you truthfully, that you are "the most beautiful of them all"? Perhaps this is why in most of apartments there are always a lot of mirrors. None of us can imagine, what would the life be, if they all suddenly disappeared. The system of Feng Shui has changed our perception of the mirrors by adding a special meaning to them, some certain philosophy, and in some cases - even magic. We learned that the mirrors can do much more, than only confirming the beauty and attractiveness of their owners. Mirrors can also bring the new ideas in the interior design, make the space around us more convenient, comfortable and harmonious, remove the old negative energy and attract love, prosperity and good luck to our homes. 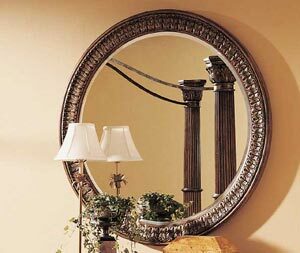 In any house or apartment there has to be a large mirror, where all family members can see their reflection "in full view". In terms of beauty, this is the only way for you to evaluate yourself as a whole, as a single image, rather than some - separated from each other -face, waist and legs, because beauty does not come in pieces, and people do not see us as "legs" for example - they perceive us as a whole. From the perspective of Chinese Feng Shui, the full reflection of a person is especially important, because this way his inner strength will always be solid and his creative and energetic potentials will remain very high. Especially good if your mirror has a free space above the human head, thereby giving people the opportunity for "growth" where it is needed: physical, spiritual, financial. If you want your mirrors to bring well-being and positive emotions to your house, they should reflect only a nice looking things. Place in front or beside your mirrors some flowers, nice photographs, which show the important and joyful moments in your life or lives of your loved ones. Any other beautiful furnishings will also do very well in this matter. You can go to the store of Feng Shui and buy a special Feng Shui charms of love and wealth, and the mirror will increase the energy, that you need at the moment. Now let's see, what is the right way to place mirrors in different rooms of your house. Mirrors in the kitchen. It is considered correct when the mirror is reflecting a table where the whole family is eating - according to the teachings of Feng Shui, it increases the wealth at your house, and the good food will always be enough here. In addition, it is helpful for a woman who wants to lose weight and eats a small portions - the amount of food, thus visually increases, plus a woman does have a constant opportunity to see herself more streamlined. Also Feng Shui recommends to hang the mirror beside the stove, so the hostess could see people entering into the kitchen and talked to them "in the eyes", which is psychologically very comfortable. Mirr ors in the bedroom. It would be better if you will put a paired characters in the bedroom, or some souvenirs of Feng Shui, they will bring additional strength to the attraction. As for the mirrors, the stringent requirement of Feng Shui - sleeping people in no case must not be reflected in the mirrors. 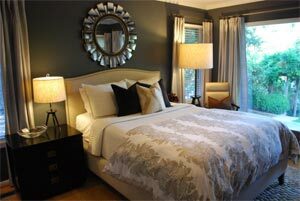 If there is a need for the mirror in your bedroom, hang it so, that it will not reflect your bed. For the night you must put some screen or curtain between the mirror and your bed. It is not only the Feng Shui rule - still it is not clear, what exactly is a dream, and where our soul goes, when we are dreaming. And do not forget - the mirror from the immemorial time is considered a guide to the other world (or other dimension), and it is still actively used in magic, fortune-telling and spirituality in general, so here it is better not to go for any experiments. Feng Shui also sees in the mirror, that is placed in the bedroom the other danger, called a "third person". Which means, that to a man and woman in their bed, mirrored, is always "added" someone else, and the Feng Shui experts say it could lead to the appearance of a "third" person in life of one of the spouses (or both), that is, a mistress or a lover. It is not what you want, isn't it? So better remove or cover the mirror, which is reflecting your bed. Here are some guidelines that will allow you to normalize relations and the whole atmosphere in the house with the help of mirrors. Mirrors must be framed - so they will keep good energy and direct it right, rather than scatter it around. Mirrors must be clean, then proceeding through them, the energy will be clean and positive. It is better not to hang a mirror on the other side from the door or in front of the window - in this case all that is good, instead going into the house, goes back to the street. And yet - it is important to immediately remove broken or cracked glass. The mirrors are working very special way, taking all bad energies, and if the mirror is broken, it is important to through it away from the house as fast as possible.